The building’s profile in a three-quarters view, either right outside the front door or from the southeast side looking across the harbor toward downtown (particularly when it’s lit up at night). The view down the building’s indoor staircase. The view along the panoramic windows in the Founders Gallery. 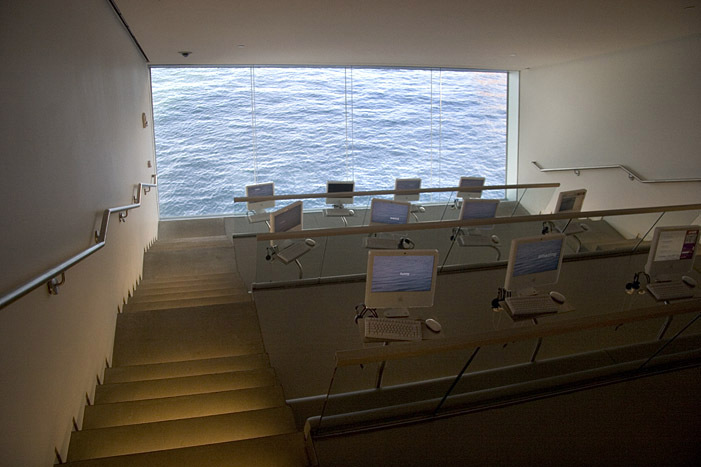 The view down the stepped seats and out the window of the Mediatheque toward the “screensaver” of water below, as seen in the photo by Mark Sullo at top.